FitzGerald Farms, LLC. 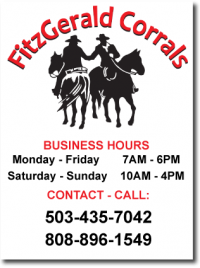 DBA FitzGerald Corrals is the Oregon and Western Washington distributor of WW Livestock Equipment, Lucky Acres Fencing, and Ranchers Livestock Equipment. Established in 1948 in Thomas, Oklahoma, WW Livestock Systems manufactures livestock handling systems, livestock chutes; crowd alleys, livestock scales, panels and gates, equine housing systems; rodeo equipment available in either hot-dipped galvanized, baked-on powder coated, or painted versions. WW Livestock equipment is manufactured from the highest quality US 50,000 PSI high tensile steel from Texas which is, twice the tensile strength of other panels. Lucky Acres was founded in 1982. Lucky Acres provides residential and commercial fence throughout the Northwest. They specialize in livestock equipment manufacturing and supply these products Nationally. Every essential product for horse/livestock containment is manufactured by Lucky Acres Fencing. They build safe, strong, and extremely durable products that are designed to last. From perimeter fencing, arenas, round pens and gates, to shelters, paddocks, and more! Ranchers Livestock Equipment began operation in 2007, manufacturing Livestock Feeding and Containment Equipment. They are located in South-Central South Dakota in the small town of Gregory. The Livestock Feeding Equipment includes Bale Feeders, Fence Line Feed Bunks & Fence Line Feed Panels, Grain & Silage Troughs, Creep & Self Feeders and Cattle Rubs with Mineral Barrel Holders. Their Livestock Containment Equipment includes Corral Panels, Gates, Windbreak Panels, Portable Tub/Alley, Loading Chutes and Calving Pens.